The Jewish community in Turkey today is very diverse with extremely different views as to whether Jews are reluctant or enthusiastic about living in Turkey. Many see themselves primarily as Turks and only then as Jews, while some believe quite the opposite. Some deny there are any expressions of antisemitism in Turkey while others would call it xenophobia and would claim that the other non-Muslim communities in Turkey share the same antagonism. 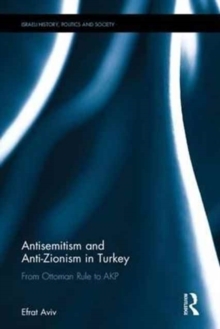 `Antisemitism and Anti-Zionism in Turkey' provides a comprehensive history of the extent of antisemitism in Turkey, from the time of the Ottomans, through the establishing of the Turkish Republic, and up to recent times and the AK Party. It also provides an in-depth analysis of the effect of Israeli military operations on antisemitism, from the Second Lebanon War in 2006 to Operation Protective Edge in 2014. Much emphasis is given to the last decade, as scholars and local Jews assert that antisemitism has increased during this period. An illustrated overview of antisemitism in Turkish media, covering newspapers, books, entertainment, and education, is provided. 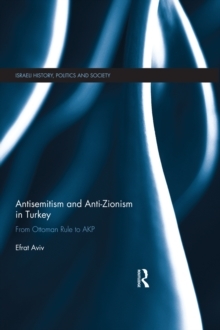 The book also analyses Turkish society's attitude towards Jews in contrast with other minorities, and examines how the other minorities see the Jews according to their experience with Turkish society and government. A unique poll, data collected from personal interviews and the use of both Turkish and Israeli research resources, all help to provide a fresh insight into antisemitism in Turkey. This book will therefore be a key resource for students and scholars of antisemitism and anti-zionism studies, Turkish Studies and Middle East Studies.